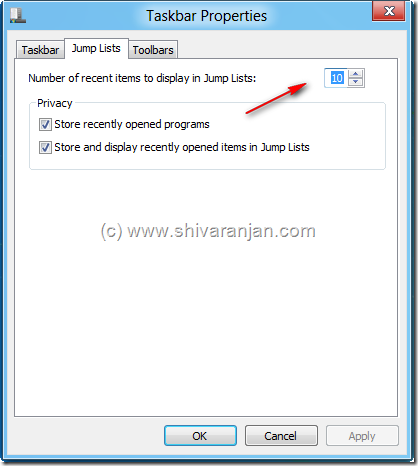 The brilliant jump list feature which was introduced in Windows 7 has been included and tweaked in Windows 8. The number of items in the Windows 8 jump list can be now controlled which is quite useful as at times I feel that the default value of 10 is not adequate for users like me. 2. Change the number of recent items to display in the jump list. The default value is 10 and you can choose the value that you intend to use. You can also opt to disable recently opened programs and disable recently opened items in jump lists under the privacy header. I dont know what exactly “jump list” can do? awesome !! keep it up……. More discount coupons is a junction of all kind of coupon codes to the general public. Get free online coupons ,promotional codes, coupon websites, free printable coupons, Get latest coupon codes, free, shipping codes, hot coupons, deals, online shopping coupon codes, coupon discount, discount online coupons, free promotion codes, promo code coupons, website discount codes, great coupons, savings coupons. Thanks for helpful share! Hey Shivaranjan! I don’t see any update on your blog for a long time. Hope that you still being well! хотите купить угги но не знаете у кого купить, вот тут мы постоянно покупаем http://www.new-j.ru/shop/brands/ugg-australia/ качество и гарантия на высоте! УРААА!!!! спасибо! Супер сайт я продал свой автомобиль за 4 часа http://www.xn—–8kccdeq7eews.xn--p1ai/ спасибо ребятам и этой компании!!! http://arlight.moscow/category/svetodiodnaya-lenta-teplogo-svecheniya/ как считаете если я сделаю подсветку квартиры из ленты теплого свечения будет круто смотреться? Thanks for sharing this amazing stuff here. the set of rules is amazing and helpful.